OHM Water Fountain! Small Indoor Tabletop Relaxation Water Feature Brings Nature & Tranquility Inside! Bring Nature Inside - Invite Tranquility Into Your Home Great for indoors at work and home! Great as a gift! 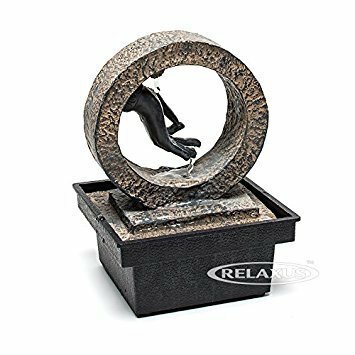 If you're looking for a way to bring the soothing ambiance to the sanctuary of your home or office then a water fountain is the perfect choice. The sound of water has always been considered calming, like the babbling brook of the gentle lapping waves. Create instant harmony in your home or workplace with our decorative & natural humidifying water fountains. Create instant harmony in your home or workplace with our decorative & natural humidifying water fountains. If you're looking for a way to bring the soothing ambiance to the sanctuary of your home or office then a water fountain is the perfect choice. If you have any questions about this product by Relaxus, contact us by completing and submitting the form below. If you are looking for a specif part number, please include it with your message.